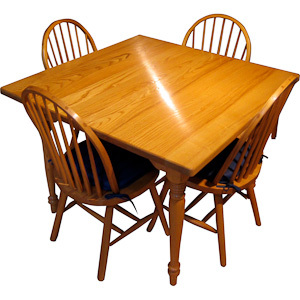 The Maine Cottage Table makes for a great addition to any kitchen or dining room. Whether you have a small intimate space or need room for a large gathering, the Maine Cottage Table can be made to suit your particular requirements. A 36" length x 36" width table is shown here and is done in Ash with a polyurethane topcoat. The expandable tables can be lengthened with one or two additional leaves. Each leaf adds an additional 12" or 18" of table top to create a table that is 36" wide by 48" or 54" or 60 or 72" or 84" or 90" or 108" long depending on the base size table. Please specify when ordering. If these sizes do not meet your needs please inquire about having us build a custom size table to meet your needs.